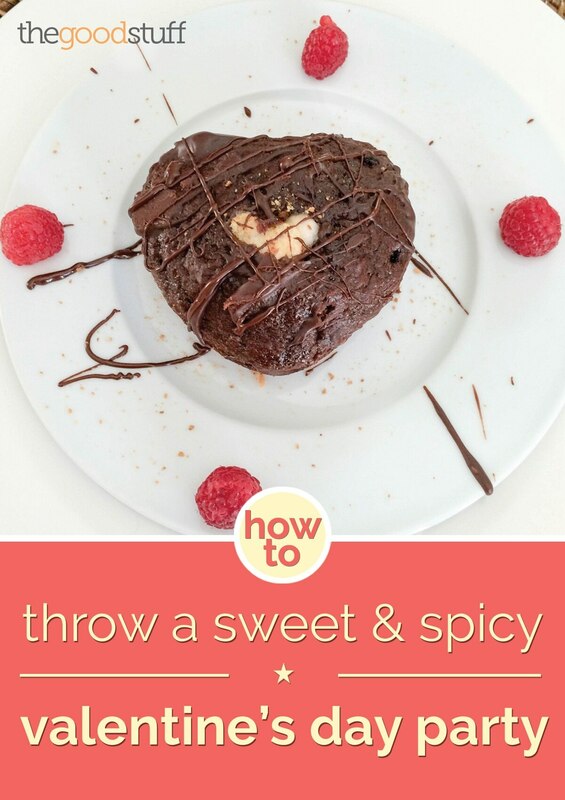 Warm up your Valentine’s Day with a sweet and spicy Valentine’s Day dinner party this year. 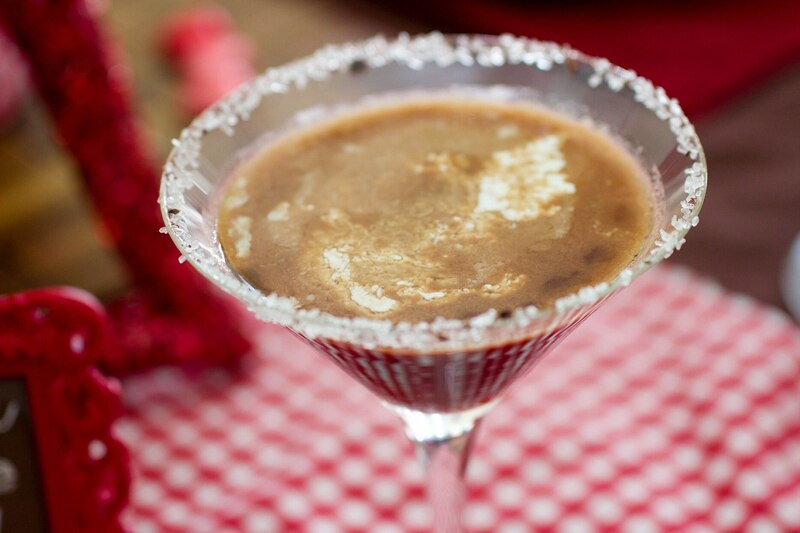 We have an exclusive menu of cocoa and chile infused dishes so you can turn up the heat with your valentine. 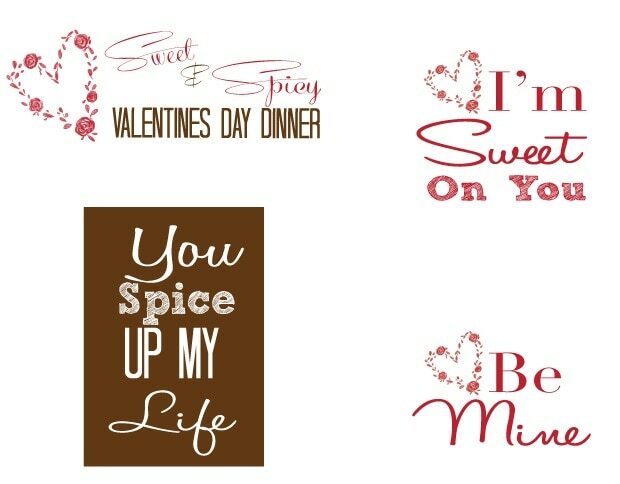 From table decor, flowers and a four course meal, we have what you need to kick up the flavor and spice up the fun. 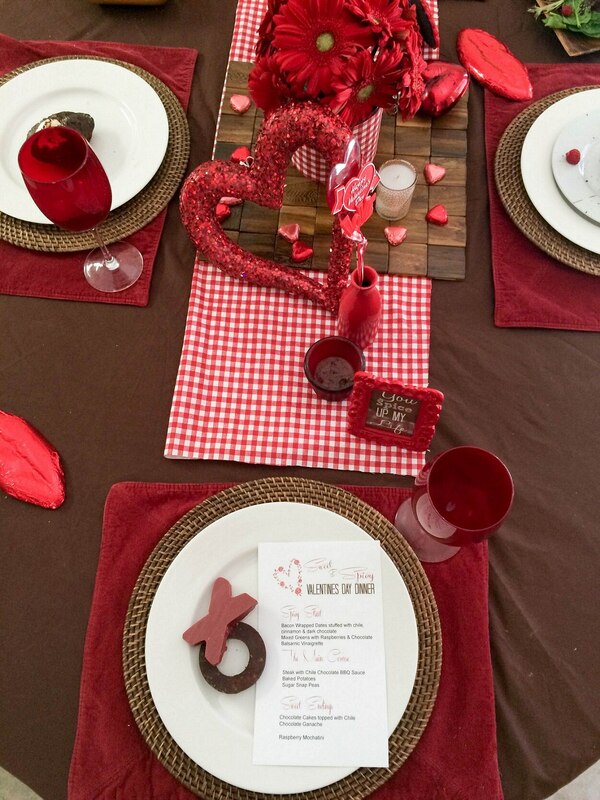 For the decor, we designed a chocolate brown and red color scheme. Always shop at home first when it comes to decor accents as you’ll be surprised with what you find. 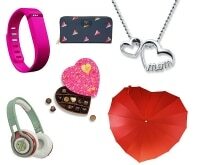 Gather all your red and brown items to see what you can use. 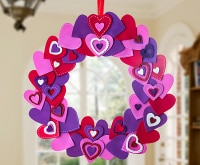 Then make a list of what you need to buy from your favorite craft stores. Creating a tabletop is all about layering and textures. Place corduroy place mats on top of a brown tablecloth and top with a rattan charger. White plates and red wine glasses complete the look. Cut a strip of red and white checked fabric to make a table runner and place a square wood place mat in the center. 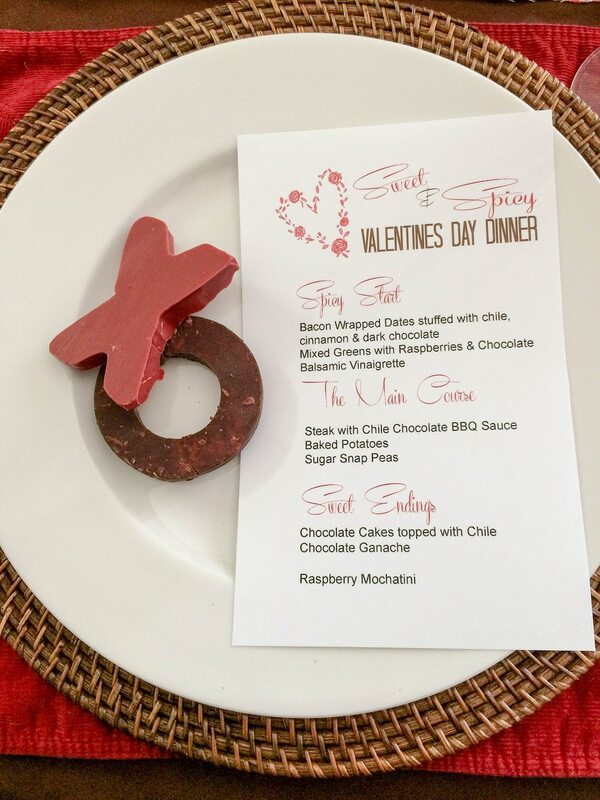 Top the plates with the XO Chocolates and Menu Card. Make and X and O to place on each plate. 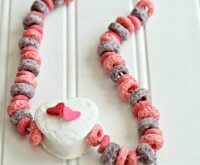 You can also wrap these up as party favors at the end of the dinner. Place red velvet candy melts and dark chocolate chips in separate microwave safe bowls. Add 1/2 tablespoon shortening to each. Melt in 30 second intervals. 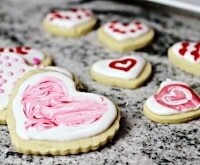 Line a pan with parchment paper and place XO cookie cutters on top. Fill 1/3 up with either red velvet or dark chocolate. Let cool. 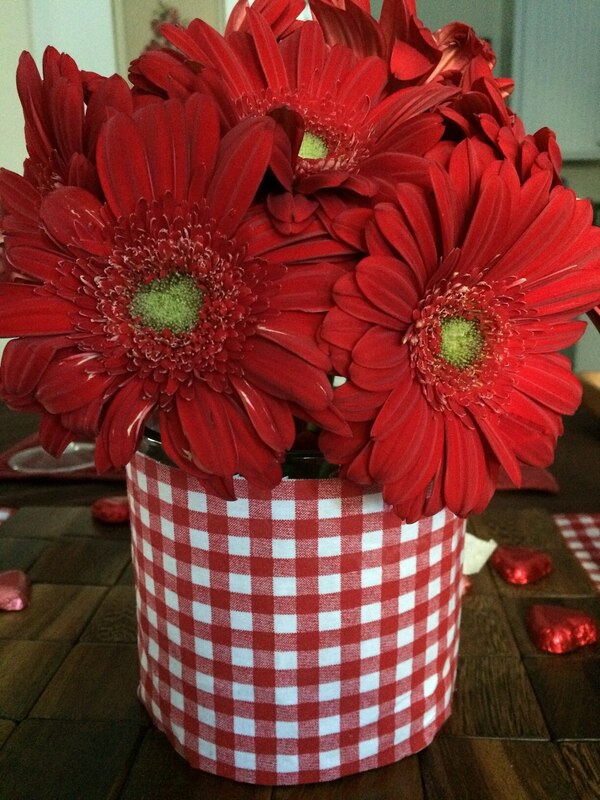 We used red gerber daisies but red roses would be beautiful too! 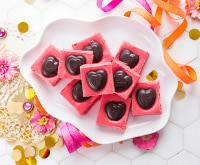 Add little touches to your Valentine’s Day party decor with pink and red foil wrapped chocolates from Dollar General. 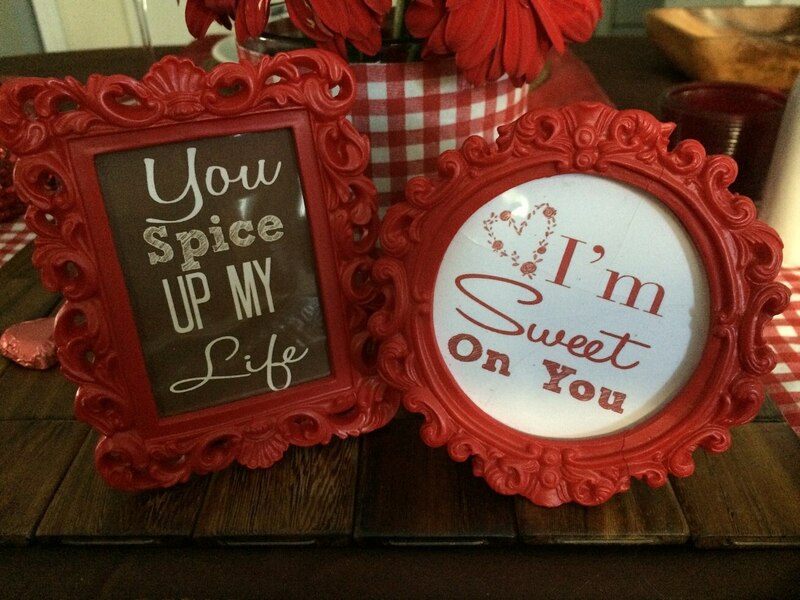 Purchase miniature frames from the dollar aisle of Michaels and fill with our printable quotes. Heat oven to 400°F. Line cookie sheet sides with foil. Place baking rack on foil. In a small bowl, stir together cream cheese and chili powder. Make a cut down the side of each date. Fill each with cream cheese mixture. Place chocolate sliver in each cream cheese date. 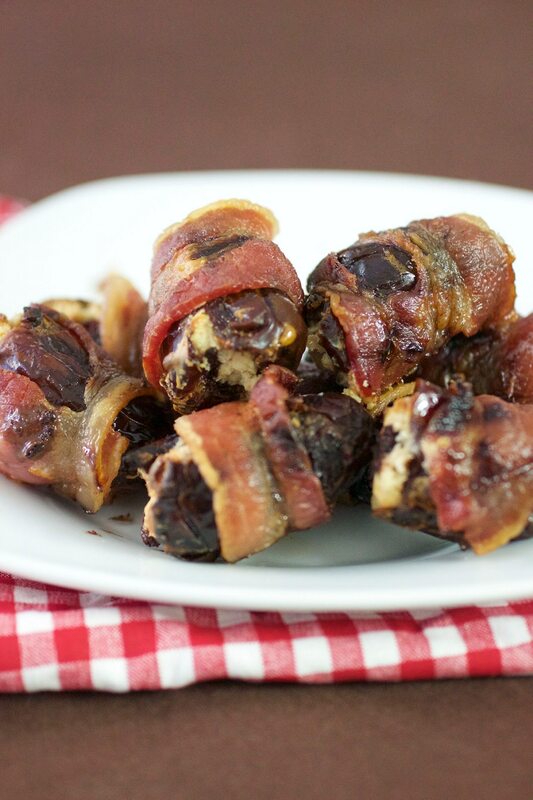 Wrap each with a piece of bacon. Place dates, bacon ends down, on baking rack. Bake for 20 minutes or until bacon is crisp. Serve immediately. Whisk all ingredients, except steak, in a bowl. Heat oven to 400 degrees. Season the filet on all sides generously with salt and pepper. 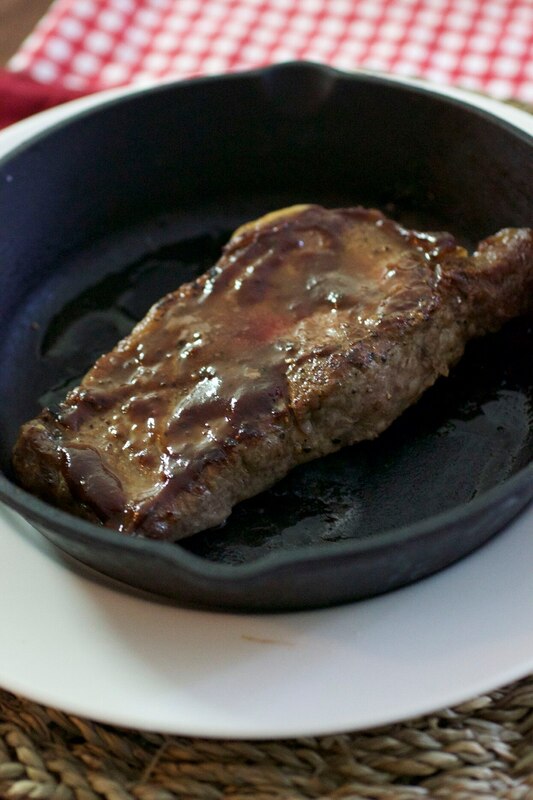 Place butter in cast iron skillet over medium high heat. Sear on each side and brush with barbecue sauce. Place in oven for 5-7 minutes, until cooked to medium, or desired. 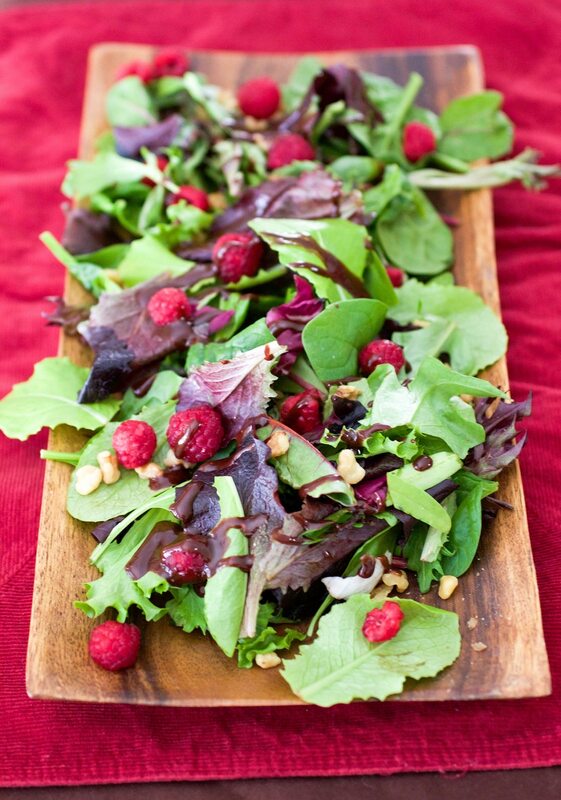 Serve a mixed green salad topped with an easy to make chocolate balsamic vinaigrette. Mix together and chill well before serving. 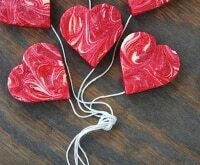 To decorate the edge, mix red sanding sugar with chocolate sprinkles. Dip the glass in chocolate liquer and then into the sprinkles. Let dry before filling with drink. Serve cold. 1 Chocolate cake mix prepared as directed substituting butter for oil and milk for water. Stir in chocolate chips, cinnamon and ancho chile powder to cake mix. 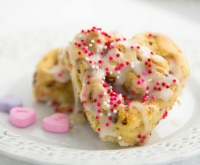 Pour into buttered heart shape pans and bake for 15 minutes. Heat up heavy cream and pour over chocolate chips. Stir until chocolate has melted. 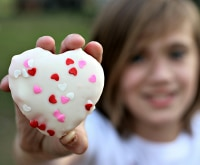 Prior to serving, press a heart-shaped marshmallow into each of the cakes. Place under broiler until marshmallow is slightly brown. Sprinkle with crushed graham crackers and drizzle ganache criss cross over the top. 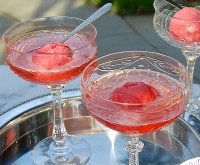 You can add raspberries around the edge for decoration. 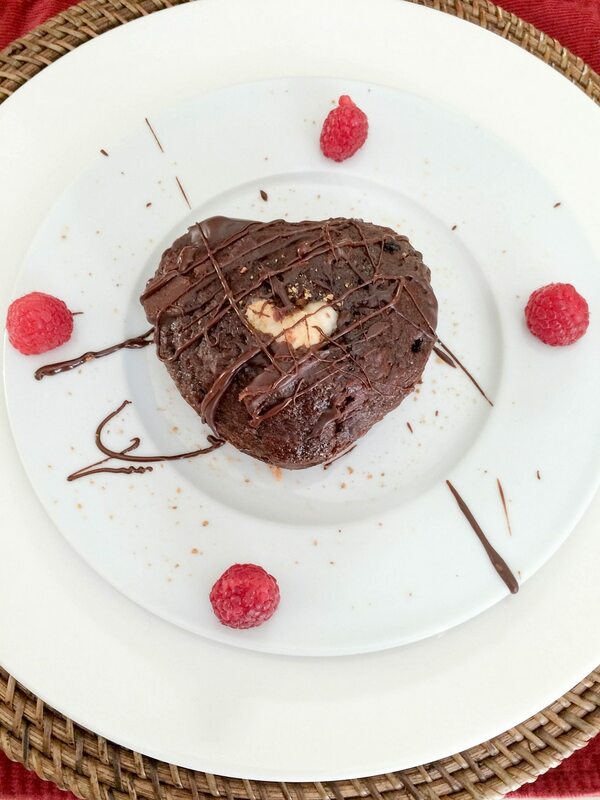 If you don’t have a heart-shaped pan then bake the cake in a rectangle pan and use a heart-shaped cookie cutter.